I arrived at Alcoutim after dark. There was only one bus reaching the town, so there wasn't much choice. On the bus, I met a fellow female hiker, who was also about to start her Via Algarviana adventure. We slept in the same hostel room, so we had a chance to chat a bit later on. Her style of hiking was a bit different: she had no tent nor a sleeping bag, and she decided to rely on established accommodation only. Thanks to it she could hike very light, with just the basics in her pack. Note: Have you missed the overview of the Via Algarviana trail? Take a look to have the big picture view of this trail! The bus stops right before a bridge you need to cross to find your way to the hostel. Later on, I found out that the trail's start was just meters away on the right. The walk to the hostel was uphill and at least 2 km, so the next day I decided not to be the purist and just continue on my way on the trail. That meant I didn't have a photo with the starting signpost. Oh, well. I am too lazy by nature to go down the hill, take the picture, and then go back up the mountain I've already done, just for a pic. The hostel in Alcoutim is an excellent place for a start. It's on the trail, so you can just continue bright in the morning. When I started my hike the air was filled with chilly fog. I could hardly see the Guadiana river - a border with Spain. There were a few boats visible, and the whole view looked magical. I started walking wearing a fleece shirt, but pretty fast I had to undress. The day was clearing and hiking always burns me like a furnace. After a lovely walk along the river on a gravel track, the trail turns and starts climbing toward Corte Pereiras. Pretty soon I could feed my eyes with the views of green hills, blooming almond trees, olive trees, and wildflowers. The fog disappeared completely and I could enjoy views back to the river valley and Spain. I was using ViewRanger as my navigating map, to which I downloaded files from the official Via Algarviana website. I saw that there was a cafe in Corte Pereiras and with the help of a local gentleman, I could stop for a cup of delicious coffee. This became my routine - if there was a cafe, I was stopping by. Don't worry - there hardly ever was a chance to stop more than once! The point to stop at cafes and restaurants was not only to rest and nourish my body, but to support the local economy. I want the people who live on the path of my hikes to be appreciative of my (and other hikers’) presence. I want our pleasure trips to a positive addition to their life and not a burden. I make a point of stopping in small stores to buy a few things (fresh bananas are always a good idea), eat a proper meal once in a while - that kind of spending should be part of our budget planning, as important as buying a new piece of gear. Refreshed, I moved on. I admired the charming villages, with their low whitewashed houses decorated with colorful frames painted around their windows and doors. I've read in the guide that there are menhirs to see on the way. I like history, and it's always fun to see something unique, so I was happy to stop and see. To reach the menhirs (Menires do Lavajo), you need to leave the trail and walk a path shown by a signpost. As the road led up, I decided to leave the backpack behind and just go with my camera to explore. And I am glad I did. I feel bad to say it, but there really isn't much to see. Just two modestly sized vertical boulders. I understand this is important to the history of mankind, but just not very exciting. Don't expect a Portuguese Stonehenge! I crossed Alonso Vincente where I saw a man, a goat, and two cats. This proved a very typical thing in the eastern part of the trail: most villages were tiny, with many houses empty, and typically only a few elderly people still living there. The official division of the trail suggests walking all the way to Balurcos - 24 km. It was way too much for me, especially on the first day of hiking. I always take the early days easy to get used to the hiking thing. So I knew I would be wild camping on the way. I was trying to figure out the best spot by studying the map and the terrain, and I thought there would be plenty of right places in the area of a river. But while the maps show terrain and water sources, they can't explain the ground quality and plant life. The area close to the stream was thickly covered with dense reeds, young trees, and bushes. There was also a lot of rocks and boulders. When I reached the stream, I hoped to find a hidden spot. I was lucky - moving deeper under old fruit trees I found a secluded area cut in between tall reeds and rocks. The spot was pretty good - close to water for meals and cleaning, away from any possible gaze. It was also pretty flat and soft. It was a lovely and warm day, but the moment the sun started to set, it got frigid and damp. Being so close to a stream didn't help much. I packed only my summer sleeping bag so I would be able to fit into the smaller backpack. I used it in chilly Norway in the summer and during winter on Crete. But I quickly found out it was much colder in Portugal. The combination of low temperature, high humidity, and a fresh breeze made the air feel much colder than it would seem from the numbers alone. I was simply cold. I also found out that somehow I forgot to pack gloves. No idea how - I could swear I prepared them with everything else! It's good my down puffy has long sleeves, so I was curling them on my hands. My sleeping bag has no hood, but that was not an issue - a buff on my neck and another on the head were enough. The area I felt coldest were my legs, as I had just leggings. I put on my hiking pants to add some warmth, and it helped. As you can imagine, sleep wasn't very relaxing. But that was just one downside. The cheerful noise the birds were making was a balm on my soul. What a blessing it is to wake up to such sounds! I couldn't pack very fast as all my stuff was damp. The humidity and differences in temperatures between day and night caused heavy dew and condensation. The tent was wet in and out, as was the sleeping bag. My plan for the day was to stop in Balurcos for lunch and then move on towards Furnazhinas. But I didn't realize how out of shape I was. When I reached Balurcos, even though it was still pretty early in the day, I just felt utterly exhausted. I decided to call it a day and let the body rest and deal with the shock of sudden activity. I knew I had more than enough time to complete the Via Algarviana trail in my pace - no forced distances, no need to do more than my body can do. The hiking itself was enjoyable - the trail leads on wide tracks through varied landscapes, continually changing and exciting. While I was waiting for the owner of the B&B, I decided to dry the tent. It was sunny and windy, so it didn't take long before the shelter was completely dry. I welcomed the comfy bed although it was way too expensive, in my opinion (55 €), and now I know it was the most costly from my whole trip while it wasn't the most charming or luxurious. The next day I expected heavy clouds per forecast, but there were just some small and fluffy clouds visible. It was warm and sunny, providing summer-like hiking experience. I still couldn't believe it was just mid-February! After Palmeira, there is a steep climb to the viaduct, but I used the breaks for an opportunity to take more photos of almond trees in bloom. Pretty soon there was another steep and challenging (for my still weak body) ascent after crossing the river. The good thing was, that getting higher meant better and better views. I loved all the green hills, covered with pines, low shrubs and orange groves. Both sides of the track were often adorned by wildflowers and almond trees. When I reached Furnazhinas, I really wanted to stop for a coffee before I move on to find a spot for a wild camp. The cafe was closed, but a few local people were chatting on the square in front of the establishment. I speak no Portuguese, and they spoke no English, but German proved a more popular language. I can hardly remember but a few words I knew, I could understand what they were saying. I was told to wait and that the owner was coming soon. So I put my backpack down and went for a walk around the village with my camera. About five minutes later I was done. While I was waiting, I hoped I understood correctly and that I didn't have to wait too long. In the meantime, another man came carrying a lemon, and from the exchange and gestures, I assumed he was looking for a knife. I was happy to help, as I always have my folding knife in the backpack's hip belt pocket. It was such a sweet moment, the cheerful laughter of all gathered, the "obrigada" I understood, and the satisfaction that I overcame my deep social anxiety to engage, even though it was difficult. Finally, 3 minutes after 4pm, the owner came and opened the cafe. The walls were decorated with the traditional tiles but the interior was rather modest with some questionable decor choices (are these animal snares on the wall???). I was happy to order a cup of coffee (and then another) before I threw the backpack on to move farther along the trail. There is a tiny "store" in the cafe, and the owner encouraged me with his gestures to get something, but there really was almost nothing to choose from. Some toilet paper, a few cans with sardines, a few bottles with some colorful drinks... If he had at least some chocolate, I might get one, alas! When I moved on from Furnazinhas, I was on the lookout for a wild camping spot. I had about an hour before the sunset, so I thought it wouldn't be a problem. But it proved very difficult - there was hardly any flat terrain, and the soil was filled with rocks and stones. You can see in the photos below what the terrain and surface was like. Finally, I found a spot on a track off the main path. It was somewhat flat, and it didn't look like anyone was using it. There was a stream not far away so I could filter some water from it. By the way - for this trip, I took new filter by Katadyn, BeFree and I am so glad I did. In this spot water more of a shallow pond than a river, but the wide opening of the filter made collecting water easy. Filtering is fast and easy, too. It was hard (literally) to pitch the tent, as the track was hardened. I used big rocks to hold the tent down. This time the camping spot was on a hill which I hoped would help with the cold dampness that's typical in low spaces. Unfortunately, it was cold again. But the loud croaking of frogs were putting me to sleep. In the morning, I cooked proper breakfast (oatmeal) and made coffee, so I started the day later. I could feel that the body is struggling with what I was putting it through, I was getting tired very quickly. Additionally, I got my period which also added to the feeling of heaviness in the body. I was also charmed by how positive, and friendly were all the people I met on my way. Humans are generally the greatest anxiety trigger for me, and I prefer to avoid crossing villages or towns. Via Algarviana crosses through many smaller and bigger villages and in the beginning, each time I was nearing a settlement, I felt the pangs of anxiety. But thanks to the way I was welcomed and treated by the local inhabitants, with time I stopped fearing human encounters. I was exchanging "Bon Dia!" and smiles, sometimes people waved to me, and at some times, they were showing me where the trail turned in the labyrinth of their white-washed villages. Sometimes they spoke some more that I didn't understand, so could just nod and smile. There never was any negative gesture, no mean face, not even a neutral one - always positive. Who knew I should have reviewed my German before the trip? While I was hiking, I tried to decide if I was to wild camp again or find accommodation. I was worried about the possible prices as the place in Vaqueiros was not on booking.com, so I had no way to check the price. The terrain was not helping - again, hardly any flat surface and no way to find anything even and free of rocks. Finally, I decided to walk to Vaqueiros. I was tired and also wanted a proper shower - so much better than wild camping when you have a period. At one point, at the top of a high hill, I reached a viewing tower. I guess it’s used as a lookout and early warning of wildfires. I climbed it and was rewarded with fantastic views all around. It is not a tower built for tourists - it’s solid, but not equipped with extra protection or railings, so I felt somewhat nervous walking on it. But it was there so I had to climb it, right? And anyway - just look at the photos, well worth the slightly scary experience. The last section before reaching Vaqueiros is far from pretty. There are some earth works done around the artificial reservoir and there are freshly exposed hill sides and heavy machinery on the spot. I am sure it will look great in a year or two. I reached the Casa de Pasto Domingos restaurant and again using a few German words combined with hand gestures, I understood that a room was available and I was to wait. After the filling meal of great coffee (galao) and a bag of chips, I was taken to the accommodation, in the center of the village, close to the church. The place was obviously dated, and I hoped the price wouldn't be too high. There was even a bathtub! I wanted to treat my tired muscles to a nice hot bath, but the tub was so cold that the hot water became lukewarm almost instantly. Oh, well, at least I was clean. Most of the hotels and B&Bs in such climates as Portugal do not have any proper heating - they are built to serve for the long summers, not short winters. Which meant that quite often I was shaking cold the moment I arrived at an accommodation. The difference in temperatures between day and night was staggering! A hot shower and an extra blanket usually did the trick, though. Sometimes (as in Vaqueiros) the rooms have space heaters to help a bit. I buried myself under the blankets, checked social media, let my friends and family know I was fine, and read for a couple hours. The next day, I knew a breakfast would be waiting for me at the restaurant. The first four days and 62 km were behind me. My body was tired but I knew it would get better and stronger with each day - it always did. If you would like know what kind gear I use on such long-distance hike, I invite you to check out the article on my gear winners. I also have a universal packing list that I use myself. 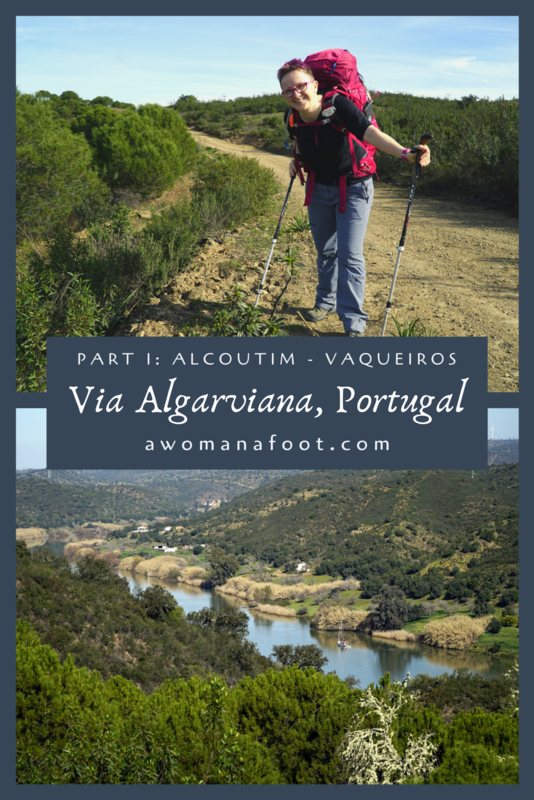 Have you ever hiked Via Algarviana or another trail in Portugal? How was it? How do you feel the first days on a long-distance hike? Pin it for later and share with the world!